Offers:Up to £60 off selected dates. Alice Springs provides a convenient hub for trips out into this ancient landscape, with the Kata Tjuta rock formations creating a dramatic backdrop of canyons and domes. One of the most special things about this land is not just its geological formations, but its significance to the Aboriginal people who live here. A walk with an indigenous guide around Uluru’s base is a truly unique opportunity to connect with one of the most ancient cultures on earth, learning about the ties between the people and this iconic rock. What’s more, you’ll witness Uluru at sunrise – not an experience which is easily forgotten. A hike around the rim of the Kings Canyon is another breathtaking experience, with its Garden of Eden and natural amphitheatre, while a drive through Ormiston Gorge offer the chance to look out for wallabies and other native creatures. As the sun falls behind Simpsons Gap and the peaks glow fiery red, you may realise you’ve created your own connections with this remote land, and created your own stories during your journey. During our trip, our group leaders take active steps to ensure our groups behave in an environmentally responsible manner, such as sticking to established trails, not leaving anything behind and not removing any plants. They are also always eager to share information about their country and culture. Our local partners in Central Australia are committed to preserving the fragile desert environment and are well versed in ways of minimising the impact of activities such as driving through remote areas and camping in the bush. Before travellers are taken to Uluru, they learn about the indigenous culture of the area at the Interpretive Centre and are encouraged to not climb the rock but to walk at the base in line with requests by the traditional owners. Really good. Local guide was excellent. Meeting the traveling group and getting to know their travel history and sharing ours. Also, sunset at Uluru was fantastic. 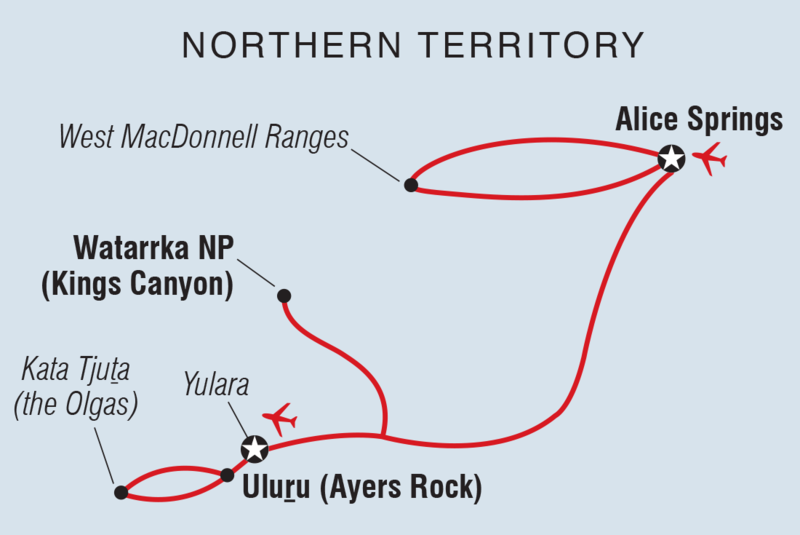 Consider a day before and after this trip in Alice Springs. Somewhat. There wasn't much interaction with the aboriginals as expected. The food preparation and camping was good for the environment. Great - first trip with this operator and set a great tone with us for consideration for future trips. Our guide George was exceptional. Would it be possible to get his email?